For the first time in my life, I can honestly say that I have seen two references to the use of bear fat in baked goods in the past week. You see, my husband, yes he of dyed black dreadlocks and floor-length velvet coats in high school, has, over the past fifteen or so years, morphed into a fantasy football-obsessed, Skoal dipping, pseudo jock/redneck. Yes, of course he still loves death metal and old punk rock and 90’s drum and bass and – occasionally – twenty year old goth and industrial music. But for the most part, he’s become nearly a completely different person that the one I first started dating in 1996. One who enjoys smoking his own pork shoulder or beef brisket in our charcoal grill on the porch and who is the proud owner of a jacked-up four-wheel-drive Jeep and the not-so-proud owner of a badass 80’s van (which, by the way, I love and think is rad – down to the cushy, faded burgundy faux-shag carpet and the “mood lighting”). One who somehow convinced me to give up my RAI Italia channel, which was the only place on tv I could catch AS Roma soccer matches and see my current crush, striker Pablo Daniel Osvaldo, play (sometimes, when we wasn’t being benched for staying out too late and partying with Daniele de Rossi) in favor of a Sports subscription that included all manner of college football, martial arts and fishing channels. But apparently, all those extra channels weren’t what my husband was after. Since we got the new tv package, our television has been stuck on one channel and one channel only – The Sportsman Channel. Yes, each evening, rather than turning on the nightly news or Jeopardy, my husband flips to The Sportsman Channel and we get to watch shows about sitting in tree stands for eight hours and occasionally get to see an actual animal get taken out. You see, the shows on The Sportsman Channel have somewhat of a formula: five to seven minutes spent discussing the preparations for the hunt – from the best suppliers of doe estrus (female deer piss, you guys! ), to the wide array of hunting weaponry from which to choose, to the dispute over whether to use actual deer antlers from a previous kill to rub together, or whether to use plastic fakes you bought from Bass Pro. This is typically followed by a full forty minutes of footage of men sitting in tree stands or blinds whispering as they watch various deer or other animals walk past them. “Oh, he’s a big ‘un,” is a common epithet. “Look at that rack!,” is another. Then, when you check the clock and realize that there is absolutely no way they will be able to actually show a deer kill in the remaining four minutes, at least two minutes of which will be sprinkled with commercials for rifles and salt licks and boot warming insoles, KA-BLAM! Out of nowhere, you hear a gunshot and a deer (or elk, or duck, or bear, or turkey) goes down. This was obviously getting monotonous to me, although my husband and son found it awesome. Then my husband listened to an episode of the Joe Rogan Experience podcast with a guest named Steven Rinella, who has a show on The Sportsman Channel called Meat Eater. On his show, Steve captures all parts of the hunting experience, much as he and most hunters try to use all parts of the animals they kill. Besides hunting footage that is actually enjoyable to watch for a grown woman who has no interest in going hunting, Steve also brings his kill back to his house and prepares various dishes that look to be quite delicious. Cue the bear fat. In a recent episode, Steve visited Alaska, where he hunted the apparently elusive black bear. Triumphant in the kill, he field dressed the bear, then rendered the bear fat over a wood fire. This piqued my interest, as he was using preparation methods that have been used for hundreds, if not thousands of years. And then, in his Thanksgiving Cooking Special, he did something that really made me love his show: he made a venison mincemeat pie with a crust made from bear fat. And a wild turkey galantine. For those not well-versed in French food and historic cookery, a galantine is “a French dish of de-boned stuffed meat, most commonly poultry or fish, that is poached and served cold, coated with aspic.” (from the Wikipedia). Oh, and he smoked a black bear ham in his backyard smoker. And immediately, I was a Steve Rinella fan. Then I found out he has written books, including one called “The Scavengers Guide to Haute Cuisine”, wherein his “obsession with a 100-year old cookbook leads him on a fascinating journey into the American wilderness.” This dude is speaking my language! There is also merch (like the awesome Meat Eater t-shirt with the sweet logo) and gear, for those inclined to actually go out into the wilderness and do hunting type things with it. Not for me. But I will watch this dude cook dishes right out of vintage cookbooks any day of the week. Oh, and that other reference to bear fat? Mark, redneck hunter extraordinaire of Discovery Channel’s Moonshiners, remarked in a nearly unintelligible Southern drawl (and that’s saying a lot for a girl born and raised in the South! ), that pies made with bear fat crusts are the best pies you’ll ever eat. So yeah, if anyone has some spare bear fat laying about, I’d love to give it a go and make some pies with it. I’ll bake an extra one just for you! Mary Randolph, a relative of Thomas Jefferson, published her cookbook, The Virginia Housewife in 1838. The volume is notable for its use of items native to the colonies, such as pumpkins, squash, shellfish and venison, and preparations familiar to English cooks. 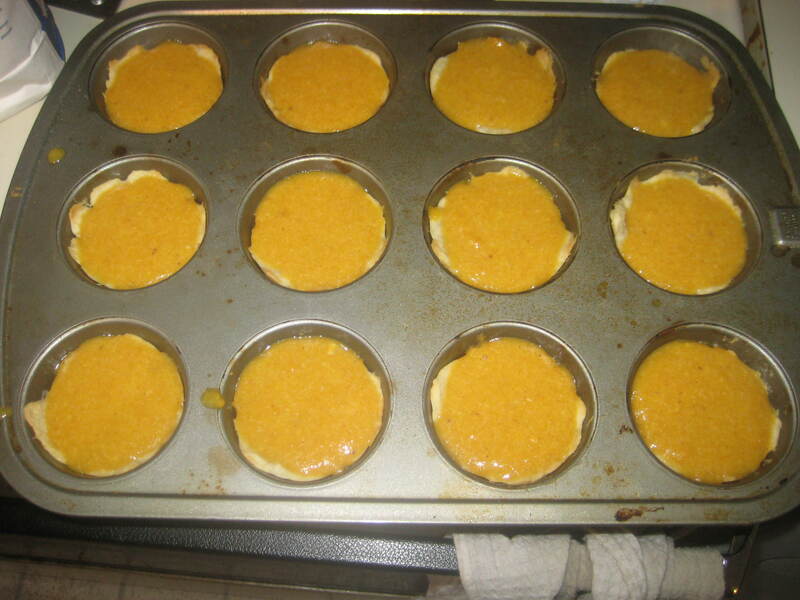 In honor of Thanksgiving, I whipped up a batch of individual pumpkin puddings to take to my family’s Thanksgiving luncheon. I mixed the water into the flour in 3 tablespoon increments, mixing first with a spatula, then later with my hands as the dough began to come together. Following Ms. Randolph’s instructions, I rolled out the dough, then smushed bits of cold butter into it by hand. I modified the recipe at this point, down to one stick of butter rather than one pound. This was because the dough got very moist and sticky very quickly and I wanted to make sure it stayed a bit flaky. 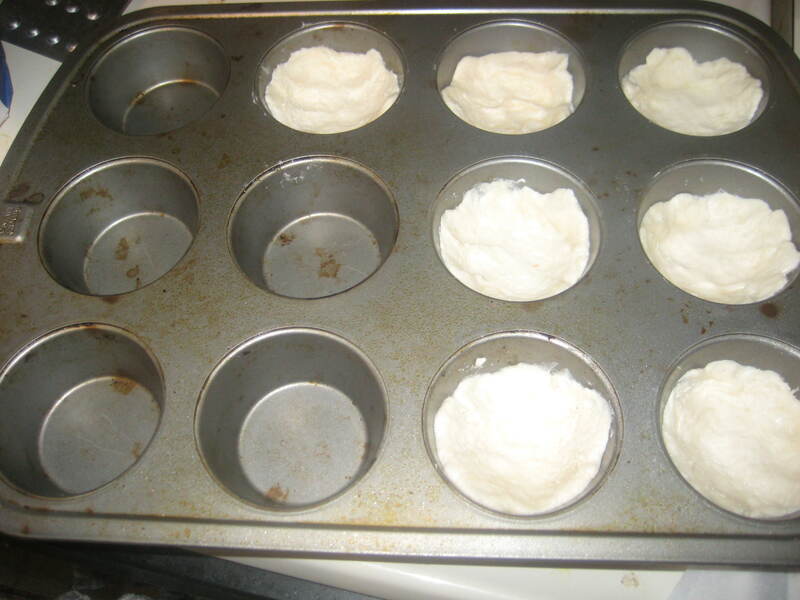 When I was done, I pulled off bits of dough, rolled them and flattened them by hand into two muffin tins. I popped them in the oven and baked them off for about ten minutes, until they were a tiny bit brown. On to the pudding! The pumpkin was central to the diet of colonial settlers once it had been introduced to them by the native Americans. Its thick skin and rich flesh, easily sweetened and flavored with staple spices of the time like nutmeg and mace, made for easy storage in the cold winter months and a nutritious and tasty dish when prepared in a pudding or pie. The pumpkin pudding would have been an earlier use of pumpkin than pie, as pudding was a common and well-known dish from England. Unlike today’s creamy dessert, a colonial pudding would have been closer to a thick, spicy custard. twist them, and lay them across the top, and bake it nicely. The recipe called for a whole pumpkin, stewed. 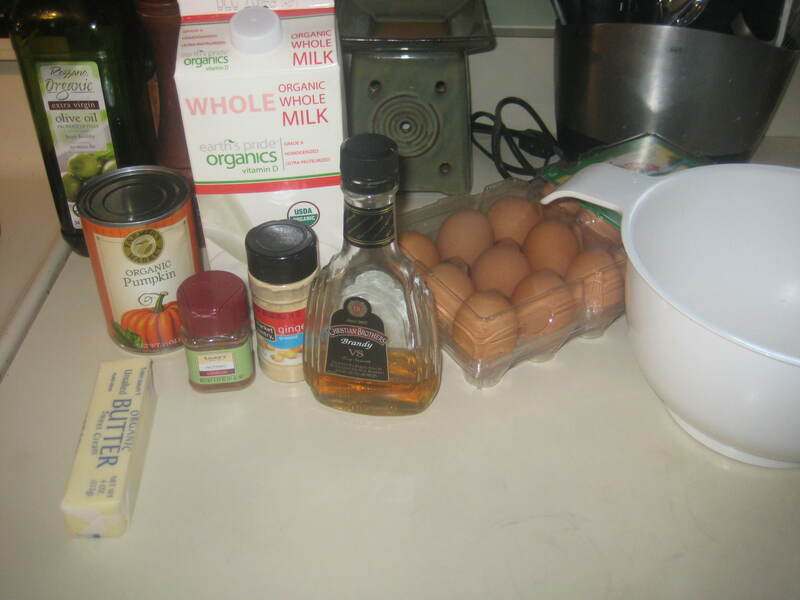 Since I used canned pumpkin, I adjusted the amount the amount of the other wet ingredients down to 5 eggs (instead of 6) and 1/4 cup of milk (rather than a pint). I was glad I did once all the ingredients were mixed, as the batter was very liquidy. Once the batter was all mixed, I poured it into the prepared pastry shells and baked them for about half an hour, until the edges started to brown and a toothpick inserted in the middle of one came out clean. These were delicious! Everyone at Thanksgiving loved them. The flavor is very light and not the traditional “pumpkin pie” spicy flavor. 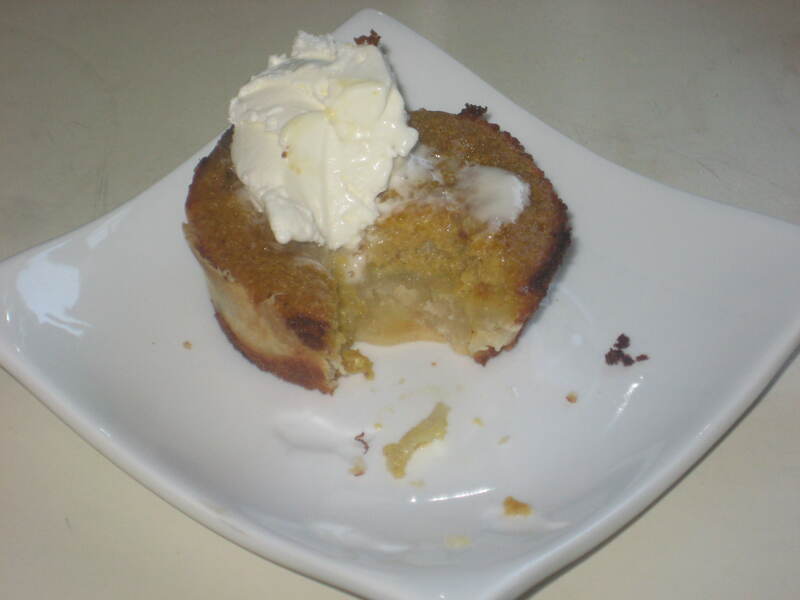 The use of nutmeg, mace and brandy are very colonial, and also very yummy. As any Virginian worth his or her salt can tell you, Thanksgiving started right here in the Old Dominion. In 1619, a full two years before the famous “first Thanksgiving” of the New England pilgrims, English settlers at Berkeley Hundred (what would later become Berkeley Plantation) held a “day of thanksgiving to Almighty God.” One can be sure a feast was a part of their festivities. * Natural Bridge – A fall harvest feast will be prepared in the Monacan Indian Village each day from Tuesday, Nov. 20 through Sunday, Nov. 25. Costumed interpreters will prepare such native dishes as turkey, trout, corn, cornbread and berry dishes. Cooking techniques include open fire, in clay and metal pots and on hot stones, according to Monacan Indian customs of the 1700’s. Admission to Natural Bridge includes admission to the Monacan Indian Village. * Jamestown/Yorktown – “Foods and Feasts of Colonial Virginia” presents a look at the colonial methods of preparing food, both for the English settlers and for the Powhatan Indians who called the area home. At the Jamestown Settlement, Native American cooking of venison, turkey, game and various stews over an open fire showcase the methods the Powhatan Indians used to prepare foods, while visitors can help unload a ship docked at the pier of such staples as salted fish and biscuit, and can try their hand at making a typical snack, a ship’s biscuit. Inside the fort, hearth cooking demonstrations according to recipes published in 1604 and 1660 will take place, as well as processing of a whole hog into hams and bacon, and salting for preservation. At the Yorktown Victory Center, visitors can learn how soldiers of the Revolutionary War ate, and can visit the re-created 1780’s farm for hearth cooking and food preservation demonstrations. * Stratford Hall (Westmoreland County) – At the historic plantation home of Robert E. Lee, visitors can enjoy a traditional Virginia Thanksgiving feast on Thanksgiving Day. Crab bisque, roast turkey, Virginia baked ham, green beans with shallots, corn pudding, mashed potatoes, candied yams, macaroni and cheese, cranberry relish, cornbread, pumpkin pie and pecan pie are just a few of the Virginia specialties on the menu. * Colonial Williamsburg – Colonial American fare is on the menu at each of the historic taverns and restaurants in Colonial Williamsburg. You can dine on traditional favorites like roast turkey, peanut soup, pumpkin pie, Eastern Shore sherried shrimp stew, mincemeat pie, beef roasts, butternut squash soup, caramel apple pie and many more. In addition to the upcoming events, Louisa County has formed a hearth cooking guild to share historic 1800’s foodways and cooking methods using a hearth fire. Keep an eye on the Louisa County Parks and Recreation website for information on upcoming hearth cooking events. If you’re in the UK, the BBC has a new series on the historical origins of our daily meals. Over three episodes, host Clarissa Dickson Wright reveals the history of breakfast, lunch and dinner through interviews with food historians and other guests. In the first episode, “Breakfast,” she blazes through English food history from the liturgical beginnings of “break fast,” to pig farming and the traditional “full English” breakfast. She interviews an archivist with Fortnum & Mason, London’s original gourmet food store, and explains the cultural reasons for the rise of the middle class and the need for stores like Fortnum’s. John Harvey Kellogg, the American doctor who pioneered cold breakfast cereal, is profiled, with emphasis on his scientific motivations in creating a “perfect laxative” for health spa clients. Viewers in the UK can watch the first episode, “Breakfast,” on BBC’s iPlayer. American viewers can locate episodes of the series on Bolt.cd or other file sharing sites.